On Wednesday, February 14th we hosted an online webinar on the importance of using a trauma-informed approach in residential programs. Where: View the recorded webinar here. This webinar featured London-based Clinical Psychologist and author, Dr. Karen Treisman. 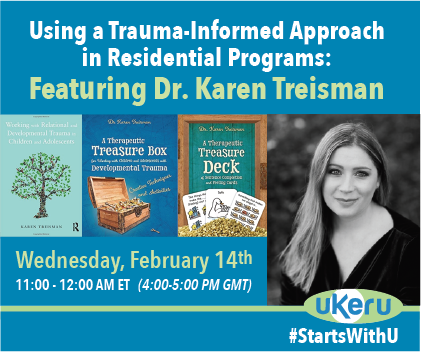 Through the use of case studies, this webinar covered Dr. Treisman’s vast experiences working with families, systems, and children in or on the edge of care and the benefits of a trauma-informed approach to care for these vulnerable individuals. Dr. Karen Treisman is a Highly Specialist Clinical Psychologist who has worked in the National Health System and children’s services for several years. Karen has also worked cross-culturally in both Africa and Asia with groups ranging from former child soldiers to survivors of the Rwandan Genocide. Dr. Treisman has extensive experience in the areas of trauma, parenting, and attachment, and works clinically using a range of therapeutic approaches with families, systems, and children in or on the edge of care, unaccompanied asylum-seeking young people, and adopted children. In addition to holding a doctorate in Clinical psychology, Dr. Treisman has undergone a range of specialist training courses including in EMDR, Narrative Therapy, Dyadic Developmental Psychotherapy, Video Interaction Guidance, and Theraplay. Dr. Treisman regularly attends and presents at local, national, and international trauma, parenting, and attachment conferences. Dr. Treisman is also a TEDx speaker on relational trauma and viewing behaviour as communication. Learn more about Dr.Treisman here. We encourage participants to add their voice to the conversation by using the hashtag #startswithU on Twitter. A certificate of completion for the webinar can be provided upon request. Continuing education credit, through Shepherd University, is also available for a fee of $49.